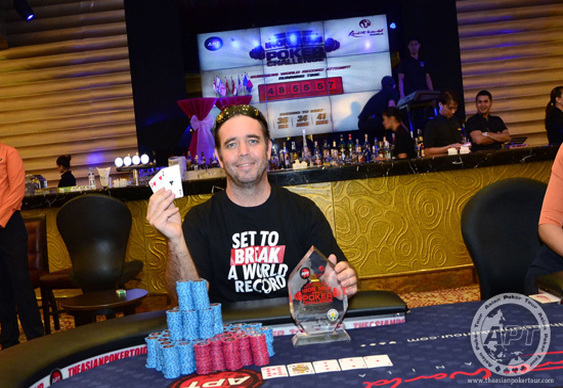 With the European Poker Tour currently raising the bar for the number of entrants in a main event, the Asian Poker Tour recently set out to break its own record. Having seen its peers aim for the largest poker event, the APT decided to buck the trend and host the longest poker tournament ever. Taking place in Resorts World Manila's Premier Club, the APT-RWM Iron Man Poker Challenge welcomed 115 players late last week. After each grinder anted up the necessary $700 buy-in the arduous journey towards the title began. With no day-end breaks or unnecessary pauses, the tournament eventually reached its bubble after 30 hours of continuous play when an exhausted Lester Edoc moved all-in with 4h 6d and couldn't find his way past his opponent's Ac 4s. Having made it into the money the likes of Sam Razavi, Liam Anderson and Damon Shulenberger were able to let out a sigh of relief as the golden 36-hour barrier came and went. Indeed, at the point when the record had been broken just a handful of players remained and it was the aforementioned Shulenberger who was leading the way. Not content to eek past the old record and call it quits, the American pro dug in his heels and finally saw of his final challenger, Choi Byung Kyoo, after an impressive 48 hours, 55 minutes and 58.5 seconds to claim the title and $18,240. Image courtesy of the Asian Poker Tour.